"What is a Crystal Skull?" 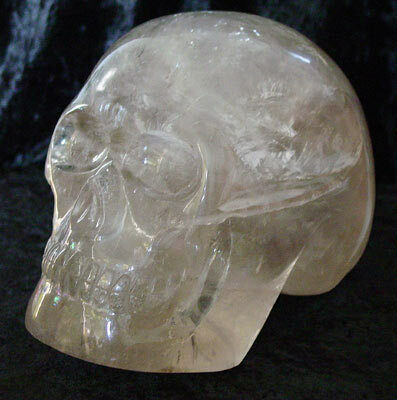 -- Well as this name or term implies we are speaking about a skull shaped object that is made from various types of quartz crystals (clear, amethyst, smoky, rose, etc ...). Most of us are familiar with quartz crystal as this gemstone serves as a key component within all of our modern-day electronics; devices that we use each and every day (including the computer you are using to read this book btw). There are many people today who work with their personal crystals in order to re-energize themselves, for healing (physical or emotional problems) or even to assist them in their development of their inner or spiritual gifts. "NEW or CONTEMPORARY" -- These are crystal skulls that are being manufactured by modern carvers. There are thousands upon thousands of such skulls in existence today. Since the middle part of the 1990's, there has been an explosion in the interest about the crystal skulls. There are quite a few people now, in all parts of our world, who have acquired their own personal skull to work with and use. The contemporary crystal skulls come in all shape and sizes and are being primarily done by carvers in Brazil and China. These skulls can even be found for sale upon E-Bay. 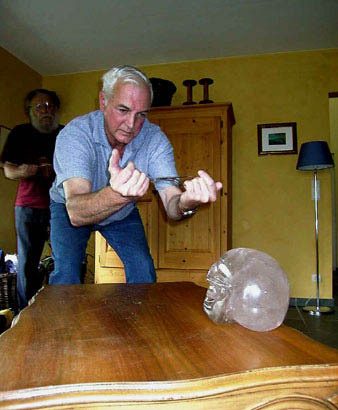 "OLD" -- a crystal skull that was created between 100 years ago to about 1000 years ago. A number of these types of skulls have been discovered within or near ancient ruins in Mexico or Central America. In general, the appearance of these crystal skulls are somewhat crude in form and upon a close examination of the surface of an "Old" crystal skull, there are usually observed some type of tool marks left by its carver, similar to what can be detected with the newly made crystal skulls. 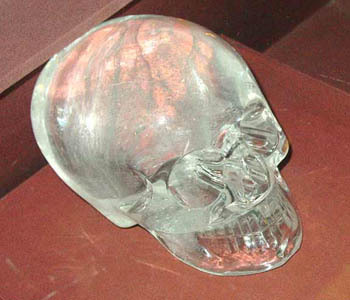 "ANCIENT" -- a crystal skull that was fashioned at least 1500-2000 years ago or created much much later. It has been suggested that some of these crystal skulls could literally be (hundred of) thousands of years old based upon the studies conducted by various researchers or as has been suggested through the legends or oral traditions of different indigenous peoples. Presently there are only a small number of such crystal skulls known publicly. As to the exact number of how many ancient skulls could exist, this answer is unknown. At the present time, we do not have an exact scientific procedure to be able to date when a piece of quartz was shaped into a skull however there are a number of different ideas and theories about how one can definitively identify a crystal skull as being "ancient"(or even "old"). Again, many of these types of skulls appear to have some type of link with different Mesoamerican cultures as well as possible ties with various Native American tribes or nations within North America. We have even heard rumors of crystal skulls that have been found or are known within South America and in other parts of the world as well. In general, we are unable to detect tool marks upon the surface of an ancient crystal skull. The implications of this condition suggests that either this particular skull was done completely by hand (over a long period of time) or perhaps, there was some form of very sophisticated and advanced technology that was utilized to make the skull, of which we are not familiar with as of yet. Most of the so-called very old or ancient crystal skulls we have personally met, have a very intense energy field that surrounds them, of which many people are able to sense or feel. This energy field can be quite strong and powerful. There are a number of different theories that have been given as to explain how these ancient skulls may have been manufactured; some of which are quite fantastic in their scope. It has been difficult to trace the true history about these objects as far as where the skulls may have originated from or which parts of the world they have traveled through. Attempts have been made by various groups to work with trained sensitives in the presence of a crystal skull and record the impressions that they psychically receive. However this method does not always guarantee success as the historical information channeled by these psychics does not always agree and even can be conflicting at times. History of the Crystal Skulls -- The public first became aware of the crystal skulls during the later part of the 19th century. At this time, many museums of the world became interested in displaying antiquities from past civilizations (Egypt, Greece, Mesoamerica, etc ...). Thus, in the 1878, in the Musee de l'homme (the Museum of Man) in Paris and in 1898, in the British Museum in London, each had a clear quartz skull on public display. It is believed that both of these crystal skulls originated from within Mexico (possibly connected with ancient ruins or tombs) during the 1860's, at the time of the French occupation of this country. Eventually both of these skulls somehow came into the possession of a French antiquities dealer, by the name of Boban and eventually found their way to the stated museums. by the British Museum since 1898. During the research for our new book, "Journeys of a Crystal Skull Explorer"we uncovered that there were a few other old or ancient crystal skulls that also surfaced into private hands during the 19th century. Within recent years, these particular skulls are now held by various individuals who have publicly disclosed their existence and in some cases, are permitting other people to sit with them in private. As we entered into the first part of the 20th century, there was an entirely different group of crystal skulls that mysteriously surfaced. Within this group of skulls there was also a strong connection with the ancestors of the indigenous people living in different parts of Mexico or Central America. 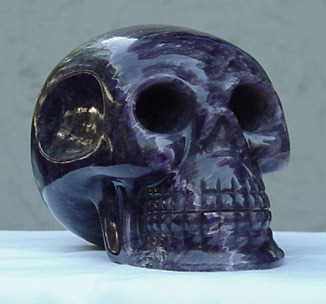 "Ami"-- an ancient amethyst crystal skull. full circumference of the quartz piece. "Ami", the Amethyst Crystal Skull: It is stated by its current owners that it was believed to have once been part of a collection of crystal skulls held by the Mexican President Diaz (from 1876-1910). Another report we have heard discussed that this skull may have been discovered in the Oaxaca area (Mexico) and was handed down from generation to generation through an order of Mayan Priests. This is smaller than a human-size skull and weights 8.5 lbs. (3.86 kg). "Ami"now resides in San Jose, California with a group of businessmen who are offering it for sale. There are of course many other crystal skulls which are believed to be "ANCIENT"or very old, but the ones we have discussed here are a very good represen-tation of the different types of such crystal skulls that are known in the world today. "The Crystal Skulls function like our modern-day computers and were used in this capacity by various (advanced?) civilizations in our past. They contain hidden knowledge and information that when it is the time for this to be revealed will ultimately assist humanity to create a Golden Age of peace and harmony upon our world!" "They were a powerful tool for healing [Body Mind Spirit] within such cultures as the Mayans, the Aztecs or even the Atlanteans"
"Relative to today: We have witnessed many people's lives being profoundly affected after having had an opportunity to spend time in the presence of a very old crystal skull. And even now, these type of phenomena are beginning to happen around the 'Contemporary Crystal Skulls' as well. Could the crystal skulls then, be a type of mini energy vortex or better yet a catalyst that is helping people to awaken to their true spiritual nature?" testing our crystal skull "Portal de Luz"
1) To work with various electronic devices to better understand how (and verify why) the energy of a crystal skull is able to affect people in such a powerful manner while in their presence. Our experiments have showed time after time that the crystal skulls appear to assist an individual in a number of different ways (both from a health point of view and in their personal lives). We performed a series of blind tests utilizing meridian based machines, EEG, a lecher antenna (shown to your left) and Kirlian cameras sensitive to recording and displaying the Aura. 2) We also discovered secret codes contained within the crystal skulls in the form of images that appeared when we applied a special process upon scanned images of the crystal skulls. 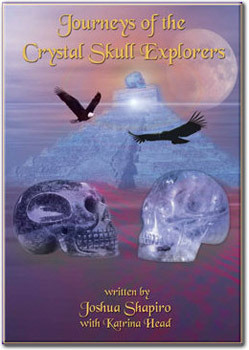 Additionally, in our investigation with the controversial Bible Code (hidden information encoded within the Torah, the first five books of the Old Testament by a numerical skipping of letters), we found this code clearly seems to understand the crystal skulls as it refers to their link to the Mayans and Prophecy; that they function like computers and are used for healing and spoke about the Mitchell-Hedges Crystal Skull. We believe the crystal skulls are one of the most important ancient artifacts that have been discovered so far in our recorded history. Because of what the crystal skulls could represent for the future of humanity, we believe that these ancient artifacts deserve a great deal more time, attention and study. This is part of the reason we were inspired to setup our non-profit research center, as was discussed before. Since the beginning of 2004, we have heard from a number of new people who have a strong interest to learn more about the crystal skulls. It has even been interesting to observe the process for when we could release our new book. No matter what we tried, we could not have everything ready until we were into this year. We suspect that on some level, the energy connected to these special crystalline objects has been dramatically increased and a new door has been opened. Thus based upon this observation, we believe that you will be hearing about some new situations or insights about the crystal skulls in the near future. On a personal level, the crystal skulls are continuing to take Katrina and I on an incredible journey all over the world. There are new places we are being invited to travel to for sharing information about the skulls or more opportunities to expand upon our research. Regardless of the source from where the ancient skulls may have originated (possibly very advanced cultures in our past or perhaps from other worlds), they are continuing to assist many people to awaken to their true inner potential. Who knows, perhaps the crystal skulls are a visual reminder for all of us that we are members of the same spiritual family who must unite now and work together in a cooperative manner to create the type of world we seek. Since the first moment I came into contact with my first crystal skull ("Ami"), I have always felt that the skulls are a confirmation of the prophecies that discuss a major transformation that our world will and is going through. So perhaps, if we each would just follow the inspiration in our heart and our soul, how to best live our lives, we can make a difference and help to bring forth a peaceful planet. The best way we believe to better understand what the crystal skulls are about and to appreciate them is to have your own personal experience with one. So please, if such an opportunity presents itself and you have a chance for your own encounter, don't let it pass you by. There are a number of different crystal skulls traveling in the world today, so it is indeed possible if you choose for this experience. Please feel free to contact us at any time, as we would love to hear about your experiences related to the crystal skulls or your thoughts. Thank you for your interest and time. We hope you enjoyed this short article. Bios: Joshua Shapiro and Katrina Head started to work together in 2009, traveling throughout the U.S., Mexico & Peru sharing their crystal skull events with the public with future trips coming up into Europe, Australia and beyond. Joshua saw his first ancient crystal skull ("AMI") in 1983 and since that time has been actively involved in investigating the skulls. 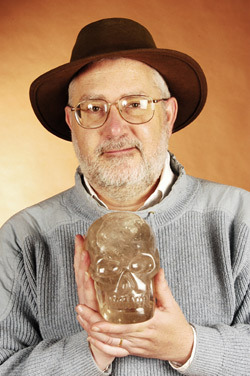 He is the co-author of the book, Mysteries of the Crystal Skulls Revealed (with Bowen and Nocerino in 1989) and the founder of the World Mystery Research Center (2001). 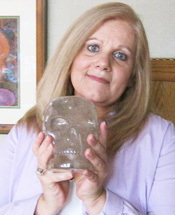 Katrina Head is a channel of universal healing energies and has natural gift to see and speak to spirits. Together, Joshua and Katrina are the guardians of nine crystal skulls which accompany them during their public events. Katrina is the manager of their company, Crystal Interdimensional Journeys & Explorations, LLC which offers spiritual tours to Peru. She has assisted Joshua with their private sessions working with their crystal skulls and the writing of their free e-book.